DETAILS: This completely renovated and professionally designed 2-story home invites comfort, and exudes a down-to-earth beach vibe. With 4 bedrooms and 4 baths, generous living space and stylish finishes, you'll enjoy a perfect setting for relaxing and entertaining! Other special highlights include a fireplace, hardwood floors, and plenty of natural light. Enjoy gatherings in the generously-sized kitchen/living/dining areas with doors that lead out to extra dining space overlooking a pond. The home features several wrap around porches with ample seating for alfresco dinners! The recently-renovated gourmet kitchen will inspire your inner chef with its granite countertops, gas cooktop, farmhouse sink, and counter seating for 4. The first floor features a king bedroom. On the second floor, you'll find two additional king suites and one bunk room. There is also an additional living space with coffee and beverage bar. Each bedroom has a flat screen TV. When you’re ready to explore, this home is only 1 minute from Seaside and 2 minutes from the beach. Hop on a 360 Blue bike and take in all that Watercolor has to offer! This is a beautifully designed house that is set up perfectly for families and it’s just steps away from the newly renovated Camp Watercolor and its three pools. We also really enjoyed the bikes as well as taking the golf cart to the beach or to dinner at Wine World. Or just sitting in the great outdoor furniture on the upstairs front porch feeling the warm Florida breeze and watching the sun set. Finally, with the Publix grocery store just around the corner, we had everything we needed for a lovely time in Watercolor. We had a wonderful time! Loved the house and the golf cart and bikes that came with it! Nice decor and kitchen was fabulous. It was a wonderful stay for a girls trip. The vacation home was INCREDIBLE. Some of us were saying it was the nicest place they ever stayed. It had plenty of space for us, and we enjoyed having dinner on the porch as well as morning coffee. Every time we had an issue 360 Blue was there to help. We could not be more thrilled that you and your group enjoyed your vacation with us in Watercolor! We agree that this home is wonderfully accommodating at all and a great place to relax and enjoy. We are so glad you enjoyed your experience with 360 Blue, we look forward to seeing you again soon! Our family had a great time staying in your beautiful home. It had plenty of room for us & our Son’s family. The grandsons loved riding on the golf cart to the beach! What a precious photo! It's definitely one to treasure for years to come! We are delighted to hear you had a great time during your stay with us and could take advantage of the golf cart with the home! Thank you so much for choosing 360 Blue. We hope to see you all back at the beach soon! This is such a beautiful photo! It's definitely one to save for when you need a little beach in your day! We are so pleased to hear that you enjoyed your stay with us in Watercolor and could experience some perfect beach weather during your time here! Thank you so much for choosing 360 Blue for your beach escape. We look forward to helping you plan your next visit with us! Our Family had a wonderful vacation at Watercolor!!! This house was fantastic!We had 10 people (6 adults and 4 kids) and the house provided us with plenty of room. 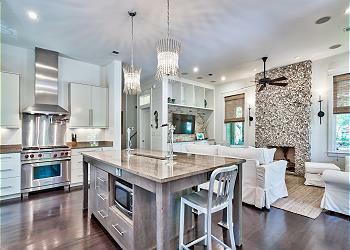 It is a beautiful house with an open floor-plan that is very comfortable for a large group. 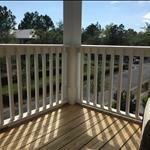 The house also has nice decks upstairs and downstairs to relax and enjoy the weather outside. Our Family enjoyed cooking dinners at the house, which included using the grill. The location of the house is great - with close proximity to Publix and the Wood Fern Park, which has a pool, soccer field and more! A definite highlight was the golf cart! The kids loved riding around in the golf cart, which was great for driving to the Watercolor Beach Club. 360Blue was wonderful to work with - as their service was impeccable. We look forward to renting again in the future! What a beautiful photo! We're so pleased to hear that your group enjoyed the property so thoroughly! We know just how important it is to have plenty of space, and we're happy to hear that you could take advantage of some relaxation time on the decks! Thank you so much for choosing 360 Blue for your group's beach getaway. Come visit us again soon! Wonderful house and great location. Nice to be off the big circle. Beautifully decorated and well equipped. We were a group of adults and one infant. We brought a pac and play needlessly, not realizing there was one in the house. The golf cart was great, very handy for the infant and a great grandmother. Thank you!!! (Please do not use the photo in any way). What a beautiful family photo! We are so happy to hear that your group enjoyed the home so thoroughly, and could take advantage of the golf cart provided with the home! Thank you so much for choosing 360 Blue for your family's beach getaway, and for taking a moment to share your experience with us. Come back and see us again soon! This home is beautiful! The decor is contemporary and elegant with marble countertops throughout, dark wood flooring, extra tall ceilings, beautiful, large kitchen, and luxurious bedding, yet the home feels welcoming and homey with large TVs in every room. We enjoyed sitting on the comfy living room furniture watching TV in the evening. We also enjoyed sitting outside on the porches off both floors, as well as having a lobster dinner (that we'd cooked on the grill) sitting at a large table on one of the screened porches. We also enjoyed using the furnished bicycles and golf cart! We barely used our car. We had a WONDERFUL stay! The only (and minor) shortcoming was the cable TV IR infrared receiver strength in each room. You have to get within a few feet of the receiver with the remote to change the channels or go through the cable guide. This is probably only a matter of buying some stronger receivers. (Oh and maybe a box of tissue in those beautiful bathrooms, and turn the mattress in the master bedroom)! What a gorgeous group! We're so pleased to hear the home was to your liking and you could take advantage of the bikes and golf cart that come with the home! We appreciate you taking the time to provide feedback on the property, and are happy to hear that these issues didn't stop you from enjoying your stay. Thank you so much for choosing 360 Blue for your beach getaway. Be sure to come back and see us soon! House and location were wonderful for a family vacation. Proximity to the Camp Watercolor heated pool was sublime, and my niece and nephew loved the playground and grassy play areas in the camp district. The golf cart is great to have, we never used the car unless to go to Goatfeathers or other local spots that require a real drive. We\'ve been coming to Watercolor for years and absolutely love it, but this house was especially great with little kids. They loved the nautical themed bunk room, riding on the golf cart, and, again, being so close to Camp Watercolor. Sounds like your little ones found their dream house! This amazing home is perfect for you and old alike and has everything you need for the perfect beach getaway. The location is second to none and puts you close to everything. We loved having you with us and hope to have you all back soon! The house is fantastic. Great location and the golf cart is a wonderful amenity. Between the golf cart and bikes we barley used our car. They only slightly annoying aspect was the tv's. We obviously did not go to the beach to watch tv, but like to watch at night. We had issues getting some of them to work. I think the box and tv were out of sync. They just need to make it easier to operate. Other then that the house was awesome. Would definitely stay again and highly recommend. We are so thrilled you had such a wonderful stay in this beautiful home! Thank you so much for the feedback on the TVs. We are having one of our techs take a look to see what we can do to make it easier. We hope to see you all back at the beach soon! Loved loved the house and the location. Very peaceful cul de sac with private woods right our your back screened in porch. Would totally recommend this house. Looks like everyone is having a great time! We are thrilled that you had such a wonderful stay and hope to see you all back soon!